The volume results from a seminar sponsored by the ’Foundation for Intellectual History’ at the Herzog August Bibliothek, WolfenbÃ¼ttel, in 1992. Starting with the theory of regressus as displayed in its most developed form by William Wallace, these papers enter the vast field of the Renaissance discussion on method as such in its historical and systematical context. 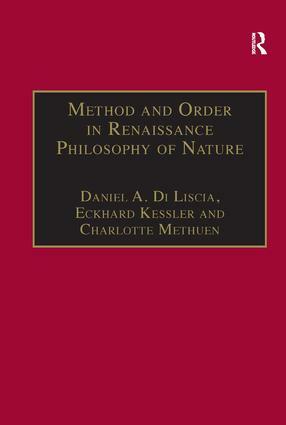 This is confined neither to the notion of method in the strict sense, nor to the Renaissance in its exact historical limits, nor yet to the Aristotelian tradition as a well defined philosophical school, but requires a new scholarly approach. Thus - besides Galileo, Zabarella and their circles, which are regarded as being crucial for the ’emergence of modern science’ in the end of the 16th century - the contributors deal with the ancient and medieval origins as well as with the early modern continuity of the Renaissance concepts of method and with ’non-regressive’ methodologies in the various approaches of Renaissance natural philosophy, including the Lutheran and Calvinist traditions. Contents: Introduction; Eckhard Kessler; Philoponus and Simplicius on Tekmeriodic Proof, Donald Morrison; El ’realismo’ de principios del S.XII y el ’eclecticismo’ platÃ³nico-aristotélico: sobre los universales y la teorÃ­a de la indifferentia, Pedro Mantas; Aristotle and Averroes on method in the Middle Ages and Renaissance: the ’Oxford Gloss’ to the Physics and Pietro d’Afeltrio’s Expositio Proemii Averroys, Charles Burnett & Andrew Mendelsohn; Method in the Aristotelian tradition: taking a second look, Eckhard Kessler; Velocidad quo ad effectus y velocidad quo ad causas: la tradiciÃ³n de los calculadores y la metodologÃ­a aristotélica, Daniel A. Di Liscia; Alonso De La Veracruz as an Aristotelian Natural Philosopher, Sarai Castro; Keeping order in the School of Padua: Jacopo Zabarella and Francesco Piccolomini on the Offices of Philosophy, Nicolas Jardine; The Foundation of an Autonomous Natural Philosophy: Zabarella on the Classification of Arts and Sciences, Heikki Mikkeli; Galileo’s Regressive Methodology: its Prelude and its Sequel, William A. Wallace; Galileo and the Mixed Sciences, W. Roy Laird; Flaminio Papazzoni: un aristotelico bolognese maestro di Federico Borromeo e corrispondente de Galileo, Michele Camerota; Principle and method: Francesco Buonamici’s version of Renaissance Aristotelianism, Hans Kraml; Non-regressive methods (and the emergence of modern science), Heinrich C. Kuhn; Vinculum concordiae: Lutheran method by Philip Melanchthon, Sachiko Kusukawa; Kepler’s epistemology, Peter Barker; Latin Aristotelianism and the Seventeenth-Century Calvinist Theory of Scientific Method, Charles H. Lohr; Sturm, Morhof and Brucker vs Aristotle: Three Eclectic Natural Philosophers view the Aristotelian Method, Constance Blackwell; Index.